Laleh June Galerie is very pleased to announce its upcoming exhibition. The opening will be on May 28 , 2009, and the exhibition continues through July 31 that will bring together works by Sylvie Fleury, Behrouz Rae, Beat Lippert, Philippe Zumstein, Crystel Ceresa, Ed Ruscha, Cris Faria, Tom Sachs and Marc Rembold, whom currently living and working in Switzerland, United States and Iran. Words Are Diamonds presents across different media the self – expressions, of ” writings / text / words ” in a poetic, pop and humorous context. The way, words sound and look, the way they change their meaning, one context to another, cultural, social and political charge, and how their message is measured by each of us. Behrouz Rae, uses drawings, photographs and videos to articulate autobiographical intimacies. Bimester (In Bimester We Trust) focuses on the subjects of psychological dissociation and the alter ego. As Rae reveals “Bimester is about duality and transference”. He uses his art as a means of self – emancipation, of therapeutic release, through which he can express the trauma of a turbulet childhood. In Words Are Diamonds, Behrouz Rae will exhibits Coming soon 1979 (2008) and Unopend Letter (2009), a series of letters that Rae has received from his mother. Sylvie Fleury since early 1990s has exhibited extensively around the world included in major museum collections worldwide as well as very prestigious private collections. After her devoted retrospective Paillettes et Dépendances ou la fascination du néant at the Musée d’Art Modern Contemporain (Mamco), in Geneva (2008 – 2009), Laleh June Galerie is very proud to present in Words Are Diamonds a new Sylvie Fleury’s site-specific wall-painting and installation. Marc Rembold, during the early 1980s, developed his own artistic languge with his own colour concept ” Light In Colour ” defined as living colours which they change colour value with the temperature of the light. His fascination with the transformation, colours in light, changing colours and spectral colours as Marc Rembold reveals “manifestation of the immaterial to material, brings visible to the eye the realm of the light’s invisible colour spectrum” is focal point in Rembold’s mode of expressions. Painting, installations, site-specific installations, objects and sculpture are heart of the oeuvre of Marc Rembold. He expresses a very personal connections to fashion, pop and trance music, state of the climate and environment, and their effects on the individuals and public mode de vie and different forms of addictions. Marc Rembold’s idea with changing colour, living colour and his invention of ” Light In Colour ” is quite revolutionary of his time and later approved by car industry, fashion and cosmetic make-up. 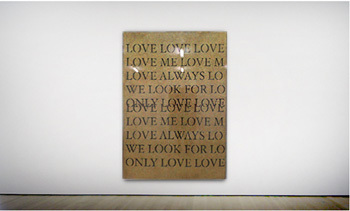 After his solo exhibition Changing (2008) at Laleh June, in Words Are Diamonds, Laleh June Galerie is proud to present Marc Rembold’s Only Love, (2007), from his serie ” Glamour “(from 1990 – to present), a serie of wood panels and canvases, with 24 karat gold, witnessing Rembold self – proclaimed “glamory pop art kitsch” and his central themes have been the study of changing, living and spectral light in colour. ” Glamour “s are also testaments to Marc Rembold’s deeper passion for beauty in all its forms – from the elevated to the everyday. Tom Sachs‘s work is included in major museum collections: Centre Georges Pompidou, Paris, Metropolitan Museum of Art, New York, The Solomon R. Guggenheim Museum, New York, The Whitney Museum of American Art, New York and the Museum of Modern Art, San Francisco. His work has been widely shown in Europe and in the United States, including recent solo exhibitions such as Logjam at the Des Moines Art Center, Iowa (2007), Tom Sachs at Fondazione Prada, Milan, Tom Sachs – Survey: America, Modernism, Fashion at the Astrup Fearnley Museet for Moderne Kunst in Oslo (2006) and NUTSY’s at the Deutsche Guggenheim, Berlin (2003). Laleh June Galerie is very pleased to presnt in Words Are Diamonds, Tom Sachs’s VGR 100, from his serie “Gold and Plywood”, a new series (2008) of pyrographed plywood panels, carved and covered with gold leaf, which adopt animalistic themes. Anthropomorphized animals, inspired by the richly detailed illustrations of an antique edition of Goethe’s fable Reineke Fuchs, the characters in these works embody various aspects of human nature. Crystel Ceresa‘s painting reflects the presence and absence of the human form, in all its forms and its fleeting moment of appearance and disappearance. The subjects’s mood is intimate and ambiguous, jewel-like flowers and portraits of personal heroes, intensely intimate, and even personal. Together, Crystel Ceresa’s oeuvre from an art historical point of view, revels in juxtaposing elements of the vanities of the baroque, the kitsch, bourgeois eroticism of the 19th century, and the symbolism, the sublimated thinking of the Pre – Raphaelites. Ceresa’s recent paintings (2009), develop the form of her site-specific wall-painting in Open House, hommage to Gordon Matta Clark in Musée Rath in Geneva (2006). Crystel Ceresa has been exhibited her first solo exhibition Drops of Poison (2009), at Laleh June Galerie, featuring California Rose, (2009), from her new body of work refrence to automatic writing. Laleh June Galerie is proud, in Words Are Diamonds to present a new Ceresa’s painting in which words and automatic writing play central. A “tree words” carved and covered with painterly phrases. Each of which can be read in graffiti chapters in almost cloying world. Beat Lippert‘s work strems from a consideration of the speculative, metaphorical and fictional dimensions of science. The various hypotheses he formulates use methods belonging to archaeology, such as reconstruction, duplication and categorisation. Laleh June Galerie is pleased to present Lippert’s Pierre en mémoire du monde,(2008). Beat Lippert among other exhibitions recently in 2008 has been exhibited in Some Magical Clangs, in CRAC, Alsace, Shifting Identities, in Kunsthaus, Zurich, Lauréat of Bourses des Fonds Berthoud, Lissignol-Chevalier et Galland de la Ville de Genève, (2008), Shifting Identities in Contemporary Art Center, Vilnius, and in Kalmar Konstmuseum, in 2009. Cris Faria has developed his own function within art, trying to be involved in social as well as political discussions through an operation as Faria reveals “Umwertung”. Somewhere between aesthetical hedonism and consumerism or commercialization. Following his idea of “Umwertung”, Cris Faria presents in Words Are Diamonds, a formal work Bonheur (2009), a drawing from his series of “frottage of banknotes on paper”. Poetic, ironic or provocative. Cris Faria’s work aspires to bridge the gap between art and life. Ed Ruscha was born in Omaha, Nebraska in 1937 and studied painting, photography, and graphic design at the Chouinard Art Institute (now CalArts). His work is collected by major museums worldwide and has been shown extensively, In 2004, The Whitney Museum of American Art organized two simultaneous exhibitions: Cotton Puffs, Q-tips®, Smoke and Mirrors: The Drawings of Ed Ruscha, which traveled to the Museum of Contemporary Art, Los Angeles and then to the National Gallery of Art, Washington, D.C., and Ed Ruscha and Photography. Also in 2004, the Museum of Contemporary Art in Sydney mounted a selection of the artist’s photographs, paintings, books and drawings that traveled to the Museo Nazionale delle Arti del XXI Secolo, Rome and to the Scottish National Gallery of Modern Art. Another exhibition of Ruscha’s photographs was organized for the Jeu de Paume in Paris in 2006. Ruscha was the United States representative at the 51st Venice Biennale in 2005. In 2009, the Hayward Gallery, London will mount a retrospective of the artist’s paintings. The exhibition will travel to Haus der Kunst, Munich and the Moderna Museet, Stockholm. Gagosian Gallery published Volume Three of the painting catalogue raisonné. Volume One (1956 to 1969) of the catalogue raisonné of works on paper was published in 2008. The “EDWARD RUSCHA CATALOGUE RAISONNÉ” is an ongoing project documenting the artist’s entire body of original work. Ed Ruscha, currently lives and works in Los Angeles. Philippe Zumstein‘s work with regards to painting in particular, between painting and sculpture, flat and predominate or prominent, focuses in to our world and his fascination for the design object that jostle for space on the ﬁctive plane of painting. As Zumstein reveals ” art is always a spatial accident”, true in both the spiritual and architectural sense, after his first solo exhibition Crash 8O8, (2008) at Laleh June Galerie, in Words Are Diamonds, Philippe Zumstein will present Light, (2009) a polymirror work, based on the position and the perspective of the viewer as everything constantly reinvents itself. For press inquiries, visual material and any further information please contact Laleh Bazargan Harandi at info [​at​] lalehjune.com or +41.61.228.77.78.